Having survived the ravages of the Roman war against the Iceni people, Victoria finds herself a tougher, if embittered heroine. She has lost her Roman relatives and alienated her remaining Iceni family. Now she means to avenge her true tribe, even if that means going to Italy where she will train to become a female gladiator. Feared and despised by most, Victoria, or Victrix, as she is known now, and her fellowtrainees, endure rigorous training, flirting with death on a regular basis. But despite general disapproval amongst the 'profession'(few survive to become fully-fledged gladiators) passionate bonds are formed, and Victrix grows dangerously close to Pulcher, her ruthless genius of a trainer. 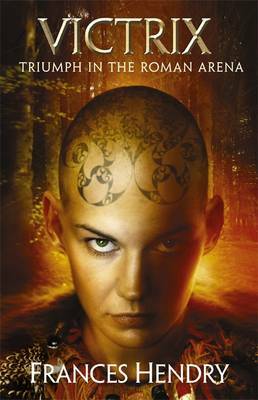 With his help, she builds herself a fearsome reputation for her skill in the arena, as well as her breathtaking tattooed scalp. But when she catches the eye of the cruel, psychotic Emperor Nero, he demands she come to Rome to be his personal muse, and Victrix faces her toughest ever battle, and a heartbreaking challenge. Has Victrix got what it takes to infiltrate the Roman aristocracy and thereby seek her revenge, or will her hardened heart ultimately rule her head..?